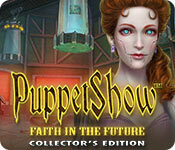 PuppetShow: Faith in the Future Collector's Edition is rated 3.6 out of 5 by 36. Rated 5 out of 5 by rjohn82677 from Puppet Show:Faith in the Future CE MY OH MY! I have played every game in the Puppet Show Series and this one is absolutely THE BEST. I really enjoyed the story line. The interior puzzles are great. The graphics and colors are just marvelous. Following the storyline makes the player want to get to the conclusion. The BONUS GAME is a great ending for the main characters. The other games in the series needed to be more "satisfying" for the player. This game accomplished every aspect that I fully enjoy: Storyline; HOG; Interior games; Graphics and Color. Definitely worth "Editor's Choice! Rated 5 out of 5 by Majestyx12 from Puppetshow fan, Spider Boy is Back and So is Black hair Doll I Loved the last Puppetshow: The Curse of Ophelia it was Super Fun and last time I questioned where is Spider Boy and I hope that they would bring back the Black haired Doll and I got my wish. They brought back so many good memories of the past games with the continued throwback with other beloved characters and some new ones (guard doll) I'm so happy to see them. I guess only fans understand. I bought all the Puppetshows. Loved all but two. The two were OK. You can pick your gender, looks and occupation. I always choose a blonde female like myself or a red head. Occupation is choose your hero-Detective, Journalist or Adventurer. You collect piggybanks to buy things like the mechanical cat (another character from past games) to keep your cat company. (It's things for your cat that Miriam made or invented). Find 32 Masks and the indicator changes color when you find them. Usually the Puppetshow Achievements have a sense of humor and tricky things on it. Last time some people complained that they are dolls and not puppets and I see the disclaimer this time saying we have all kinds of puppets and dolls. Give me a break. They are both cool and ok in my book. Now you have people chirping about the disclaimer. People can always find something to complain about. I just want to have fun and play games. If you don't want to play games, why are you here? I thought the end of the trial had a nice twist and I'm buying it at the next good sale. Rated 5 out of 5 by Marja67 from I Like It! I like all the Puppet Shows. I own them all. Great graphics, music, sounds. The story goes along with the usual puppetry. The game has a hard setting if too easy. I am giving 5*. Rated 5 out of 5 by MrsBen from AMAX DOES IT AGAIN!!! "PUPPETSHOW: FAITH IN THE FUTURE", in my opinion, is the best Puppet Show game, yet, and maybe the best Hidden Object Game I've played!!! The graphics are very well done and the background music is nice and eery!! I've only played the demo down to 14 minutes remaining, but I know I will buy it! 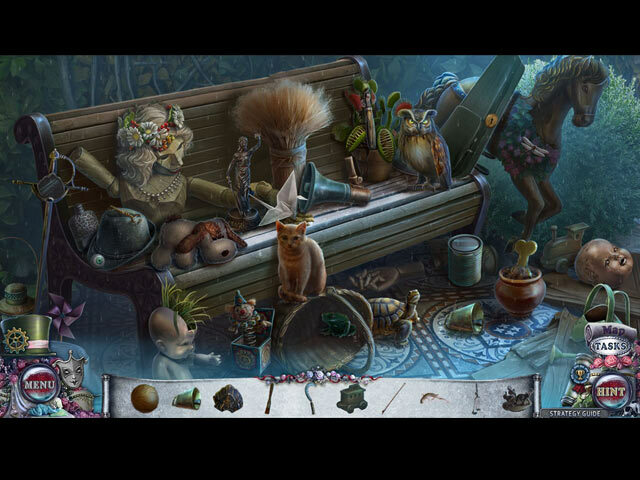 The game play is intuitive and the Hidden Objects are recognizable. Not a single glitch!!! Not one complaint from me!! Be sure to take the time to try it... If creepy is your thing, I think you will enjoy it!! Rated 5 out of 5 by gamephan from Puppet's Arise The game has sharp and detailed visuals. There are clever HOPS sewn in the fabric of the story line. Great character development drawing you in to see where you are headed and can the heroine be saved. Rated 5 out of 5 by sunnyglow from MY “FAITH IN THE FUTURE” OF AMAX GAMES HAS BEEN RESTORED REVIEW BASED UPON THE ENTIRE GAME 4 Chapters Plus a Bonus Chapter - Strategy Guide: 45 Pages OVERVIEW: Detective! Prepare to investigate another puppet-inspired mystery. In this case, you must save the terminally ill Miriam White from an evildoer. Super scientist Miriam, with the help of her assistant, Frank, has attempted to transfer her soul into a puppet. However, something has gone awry and now poor Miriam’s consciousness is split between her body and her lookalike puppet. Beware! In trying to save your friend, you could end up as a puppet yourself. Who is the villain here? There are some surprises as you investigate this case. OPINION: Surprises? This game surprised me! It is a great game! The demo does not do justice to this game. The game still has numerous puppets; however, the elements I found irritating in the previous games of the series are gone from this game. 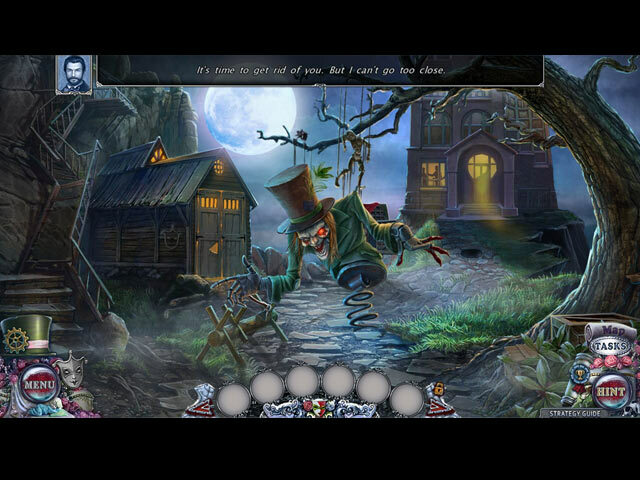 There are no helpers in this game, although there is a puppet with scissors who helps at the very beginning of the game. However, she disappears after the demo. The grunting dwarf does not appear, thankfully. There is a gimmick, half a pair of scissors, in the bonus chapter, but it is only used three (3) times. This game should appeal to those who like this series. The story, although a little offbeat, does touch upon the dark side of robotics. The graphics are incredibly beautiful as in all of AMAX games. The hand-drawn scenes are breathtaking! The pace is decent, although I found a few slow spots throughout the game. This game demonstrates that you do not need gimmicks nor helpers to produce an excellent game. There are some very creative HOP scenes and puzzles in this game – including a NEW TYPE OF HOP SCENE. I love the activities in this game. However, despite all this, I do believe it is time to end the series. I am tired of this series and the numerous puppets. It is time AMAX cut the strings and put those puppets back in the box. I would love to see this caliber of game in a new series. 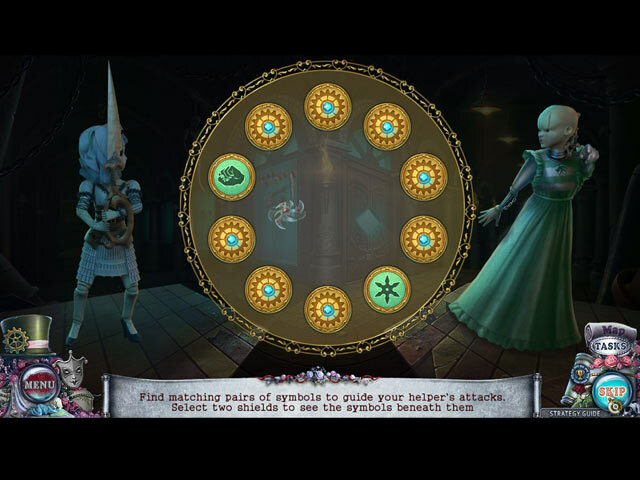 MECHANICS: There are the usual four (4) levels of play including a customized version. You can choose your character’s appearance from six (6) choices – three (3) are male and three (3) are female. They include choices between Detective, Journalist, and Adventurer as well. You collect coins, as in all AMAX games, to purchase items for a special room. There are twenty-six (26) morphing objects (masks) and eleven (11) collectibles (coins). You can replay fourteen (14) HOP scenes and eleven (11) puzzles. However, with the quality of these puzzles, I wish AMAX had provided more puzzles to replay. BONUS CHAPTER: It is a sequel. You are still on a quest to save Marian. You are off to locate a book which contains a formula for a remedy to save her. There is a gimmick in this chapter; however, it is not used often. You receive a scissors blade to cut things. It is a decent length and there are some fantastic HOP scenes and puzzles within this chapter. HOP SCENES: Many of the HOP scenes are amazing! From what I could count there are twenty (20) HOP scenes plus a myriad of mini-HOP scenes in which you search for a small number of items or pieces of items. They are creatively designed. My favorites are the search and replace scenes. There is one scene in which you search for morphing objects. There is another which is mathematical in nature. Solve equations and then search for the numbers using a special mirror. What I did not find, nor did I miss, were boring lists of items within this game. AWESOME NEW HOP SCENE - STENCILS: Toward the end of the game there is a scene I have never seen before. You place animal-shaped stencils within a scene. You must locate the colors within the scene which best fit the animal involved, and then, place the stencil in place to produce a rather cool depiction of the animal. Creative genius at work here! PUZZLES: The puzzles are better after the demo. From what I could count there are thirty-four (34) in the game. They vary in design and difficulty. You do have a few puzzles which allow you to choose between “casual” and hard” modes of play. There are quite a few maze puzzles which are just “a-maze-ing!” Listed below are some my favorites after the demo: SPOILERS: SOME OF MY FAVORITE PUZZLES AFTER THE DEMO: A. Logic puzzle. Place three tokens into position on a sliding scale according to clues given concerning their placement. B. Maze puzzle. Move a marionette through a series of hands until it reaches its strings. You must rotate the hands to move it from hand-to-hand. C. Choice between casual and hard. Maze puzzle. Lead a mouse through a series of mazes picking up keys to unlock doors as you proceed. You are give a specific amount of moves in the hard version. D. Beat the computer. Card puzzle. Match up pairs of cards which are related to each other, attempting to get more points than the computer for the matches. E. Marble shooter puzzle. Remove images by shooting a marble with an image upon it at a moving chain of marbles. Shoot the marble toward similar marbles so that three or more of the same image are removed. Remove all the marbles before the chain reaches the end. BONUS CHAPTER: F. Map puzzle. Move a tram down the track to its destination by landing on the correct spots to remove obstacles in its path. If you make a mistake, you must start over. G. Map puzzle. Plot a course using arrows to lead a key through a pathway to its designated lock. You will need to place the arrows in place before pressing “Start.” 3X for 3 different colored keys. Rated 4 out of 5 by Rabukurafuto from Gives me faith in the future I love PuppetShow and have finished every single game in the series. They excel in aesthetics and atmosphere, but never have done extremely well in plot. Faith in the Future does a better but not perfect job at the story. As usual, you begin with the cliché of visiting a friend in peril, something PuppetShow should move away from in future games. The music and graphics are as good as ever. I was disappointed by the lack of a cute helper, a series quirk that I absolutely love ever since The Prince of Immortality, and the games lacking helpers tend to rank lower for me (other than the first four games). There is marvelous scissors-wielding puppet that I really enjoyed though. You get to play her in the bonus game, but I want the next game to have her or another cute living puppet as the player character. I enjoyed the many callbacks to previous PuppetShow games scattered throughout, especially the reappearance of so many previous puppet helpers, even the one from Arrogance Effect, who previously hasn't made any sort of cameo, so I'm glad to see her again. Faith in the Future was not particularly challenging and suffered from too few HOPs. I hope to see this reversed in the next game. In most respects though this is a good sign for the future of the series. Rated 4 out of 5 by Hersheyguy1 from I Have Faith for the Future of this Series! I have decided to start reviewing games more often, so this is my first review in a while since Puppetshow Arrogance Effect. Overall, this game is an improvement from past installments of this series, however, it does not beat Price of Immortality in the slightest. This is a solid game Amax Interactive/ERS Studios and is a good game fore beginner or intermediate players. My actual rating would be a 3.5, but I rounded it up to 4 stars for the reasons stated below. The following pros and cons list may help your decision for purchasing this game. Pros: - Gorgeous graphics as always from this developer! - Good, straightforward story that makes sense and for the most part is original - I love that the achievements include fun facts about the developer and their process for making the game - The bonus chapter is a good length and adds satisfactory playing time to the game - The pace is good throughout the game! - I liked the creative HOS in the bonus chapter where you match the stencil of the animal to objects in the shed that match their color. - I am not a big fan of gimmicks, but I liked the scissors in the bonus chapter and the puppet helper in the beginning of the main game Cons: - Puzzles are very easy and are not very creative - Most of the HOS scenes are used twice - Most of the HOS are lists I do not care for the extras in the Collectors Edition version of most games because they do not add too much play time. I would mostly recommend the SE because the bonus chapter is a separate story from the main game and the extras are nothing special except for the achievements which I mentioned above. Rated 4 out of 5 by pgillenw from Worth a Play! Well this game did not spur my amazement like the early releases of the PuppetShow games but I none-the-less enjoyed. I do wish the creative team would revisit the 1st releases and consider a new course to take. Rated 3 out of 5 by HauntedDoll from Lovely Graphics - Good for Beginners Loved the graphics - so painterly and intricut, a blend of romanticism and steampunk. Unfortunately the mini games were repetitive and not challenging. Great choice for beginner players to HO and adventure games. Rated 3 out of 5 by campingramps from The puppets return I've played this series before, been a while though, and I have some of the first ones that came out. They are enjoyable, however, this one started out fairly slow and, frankly, pretty idiotic. The characters are leaning toward the comedy side and are hard to take serious. However, the more I got into the game the more I enjoyed playing it. The HOs are a challenge but not to the point of major difficulty. Only had to use 1 hint and the mini games make you think. Graphics are a cross between below average and great. Why they couldn't be great for the whole game, I don't know. The little puppets are well drawn and add just enough comic relief to make this a good game. I recommend this one and, as I have said before, Big Fish needs to add a 1/2 star rating because I would give this a 3 1/2. Rated 3 out of 5 by cathybobcat from SHORT AND NOT CE WORTHY Another short and lame game. I have all of these and think this was the worst of them all. There were parts I enjoyed and many I did not. First of all, the characters are very cartoonish, shallow, and not convincing. They came across in an extremely juvenile manner. The voices are the biggest turn off about them, especially Miriam's, whose was so whiny and phony. I got sick of listening to her....."please....please". It was like fingers on a blackboard and I muted her. There are only so many story lines that can be used, so I didn't mind the story and dealing with the duos, even though I thought it was lacking and childish, as well. The dynamics of gameplay is what takes precedent over the story for me. The graphics were atmospheric and typical of this series. You are not overwhelmed with the collecting of inventory for everything. You have the option of choosing your character. There is the clicking on of conversations, which is an annoyance to me because it is senseless and makes no difference in this game and is also time consuming. The going back and forth was not in excess. There weren't that many scenes, come to think of it, so maybe that is why they added all of the conversation and puzzles, so it would lengthen what should have been and could have been a longer and more quality game had they put more effort into this. There were some full HOS that were quite good, but they were outnumbered greatly by all of the mundane mini games. There were a few mini hos that are nothing but a waste....finding a few items. Only a few items are in them to begin with, so they are right there in front of you. It cheapens a game. Too much of the gameplay is taken up with the mini games, which I highly disliked having an overabundance of. You're either doing them or skipping them. It was too many, often one right after another, taking up so much time in what is a very short game. Even though many of them are quick and doable, it was still excessive. It takes away from the story as well as the play, creating an imbalance. Extras indicate you can replay HOS and puzzles. As there were so many puzzles, they are not included in the replay or you would have over 30 of them for sure (I didn't keep count of them). Your collectibles are very limited. There are piggy banks to find that deliver coins that you can use to buy mechanical toys for a cat. It is not so impressive. There are also some morphs which I care nothing about. Unless you can see them, you spend your time staring at a screen, which is not my idea of a good time. I neglected to even try to find them. Probably the biggest disappointment of all is the incredibly short length of the Bonus...unbelievable. It is not CE worthy nor worth the price for it. It is a cheat. The BC was nothing but a few new scenes....nothing new or different to add to the story....had a few added hos (one was a stencil that was very interesting and creative)....and too many mini games taking up that short BC time....one where you are mixing a potion, which I hate....more time consuming. It took me about an hour or so to complete the BC. I would say that when the SE is released, it would suffice just fine as the main story ends well without the unnecessary BC in this CE. There isn't anything adequate here to warrant this as a CE worthy game, particularly the lack of a proper length for the entire game. Rated 3 out of 5 by crwillhite from It was "ok"...which is the definition of 3 stars....not good...not terrible If you like puppets and dolls......you might like this......there are numerous different doll and puppet characters......You do get to pick who you are......you can be a guy.....you can be a gal....you also choose your profession. I am not sure it matters, but it's nice to have a choice. The story begins when you receive an invitation from an old friend who needs your help....my response to that was, "sigh"..... I have helped so many old friends....I'm kind of tired of my idiot friends getting into trouble. Of course, the instructions tell you not to lose your invitation or you won't get in to the house of your friend. I love that, given this is a computer game, and it's not possible to lose anything as all items are stored in the inventory. You get to the mansion where your friend lives; and you learn that she is conducting secret experiments when you read the town bulletin board. Yup, the old town bulletin board happens to be right outside your friend's mansion. As you walk to your friend's front door, a puppet gets into a fight with a masked man who just disappears. You next look in the window and see another man use a blue crystal on your friend....yup....that's a new idea.....a crystal.....I kind of lost interest at this point. I really had no idea what was going on. The puzzles were easy, and I just need a new story line. I refuse to purchase a game anymore that I truly don't like. I am frustrated by the lack of any originality. I'm wondering if we submit ideas maybe the developers might read them? Have we had any martian stories? What are some of the reviewers ideas. As usual, try it yourself. If you like puppets and dolls, you might like this. I don't. Rated 3 out of 5 by dancemom1 from Okay for beginners... Hello friends! As usual, I review mostly on the game play and leave the story to others...however, I do comment on the story as well. We have had so many additions to this series, that I lost count long ago. This game never changes. The graphics actually are quite nice in this one, with very little blurring. Colors are bright, but not overpowering. Game play was good, with no glitches or problems during the demo. Music is pretty much the same as all the others in the series. Voice overs are well done and appropriate for the character, but the male voice doesn't seem quite old enough for his character. Sound FX are the same as in all the others in this series and gets quite annoying after awhile. HOPs were somewhat interesting and varied, but nothing new. The scenes were clear and items were not difficult to find. I didn't see that we could switch to something else if we got bored with the HOPs. Puzzles were not difficult and again, nothing new. None of them really took any time or brain power to complete. Hint system is very helpful, but I did not see that it transports to longer locations. Maybe I hadn't gone far enough yet. The only collectibles I found were piggy banks, which are fairly large and not hard to see. You collect coins from these banks in order to update an room. This was boring for me. We also have morphing items that are all the same and plenty large enough to see. They do morph fairly quickly, so be on the lookout for them. Nothing extra. This game was a bit better than the last in this series. We still have those creepy spider head puppets. The story was slow, HOPs were few and far between. We did have a fair amount of character interaction, which was a plus. I made it through the entire demo, but by the end of it, I had almost forgotten what I was there for. Personally, I think it is way past time to retire this series. I'm sure there are those who will find this one fun and challenging, but I wasn't one of them. This one just didn't have any challenge at all. I will recommend this to beginners only. No, I will not be purchasing this game for my collection. No sure how anyone could give this one a 5.0...I gave it a 3.0. As always, try it for yourself and see what you think. We all have different tastes in games and you may find this one to be exactly what you are looking for. Thanks for the review. Play on! Rated 2 out of 5 by transonly from Not the best I loved the first PuppetShow game I played years ago. I still find it a challenge. This was the 2nd one I tried. Very different. Way too easy. Finished the demo in 40 minutes. And I never saw any collectibles. Why do they call it a collectors edition? The only reason I can think of is to charge a higher price. I only gave it 2 stars on the challenge level because I'm in a good mood. Not a buy for me. Rated 2 out of 5 by belamba from A boring game... When I read a 5* review I thought 'at last an Amax game to d/l.' I've all the games in this series, and hoped for something great. The story line is the usual dross, but that never bothers me as most games have silly storylines. The gameplay was so linear that no thought was needed at all. It struck me as a very lazy game; find the bits that make up the symbols. Once was enough, but in the demo it occurred 3 x (so 9 in total), a real yawn. The HOPs were a bit different but nothing to go 'wow' about. Graphics were excellent as we'd expect, and morphing piggy banks to collect. Puzzles were easy peasy. Far too much dialogue - just went on and on and on. I couldn't wait for the trial hour to end quite honestly. I'm sure some will like this game, but I think its time to end the 'Puppet Show' series. Rated 1 out of 5 by 3_Cat_Night from No help, no forum for this game I was loving the puzzles, the visuals, until I got stuck. After checking the strategy guide, it seemed I missed putting the pieces of old advertising together. The "together" version is needed for a further step. I also checked the walkthru and it is identical to the strategy guide. To me ii is a mystery where to put these advertising pieces together. My first move was to check the forums, and lo and behold, there is no forum for this game! Why? I am stuck and can't ask for help. Can't progress. I wish I could give this a better rating. Rated 1 out of 5 by BeachieKeen from Stinky I could not go more than 20 minutes into the demo. This game stinks. Rated 1 out of 5 by mmdgaston from puppets need a long nap. this poor series....no direction, very easy. this once great series is long over. the first few were great, not this one. boring beyond belief. Rated 1 out of 5 by codom from Another Nope What has big fish games become.....here's one answer...an endless stream of serial games done to the lowest standards of quality possible. This game is typical of AMAXs most recent fair. In a nutshell, it's bottom rung quality and an endless array of the same bland tasks we've seen a thousand times over. This game is short and boring. If you don't trial it before buying...well, it's your wasted money. This series should have died about 7-8 games ago. Rated 1 out of 5 by MissAbby from Please Cut the Strings on This Puppet Easy to string together a plot on this one. Just play any of the last ten or so PuppetShow games, and there you have it! The first couple of PuppetShow games were good. They had originality and mystery. They were fun. This 14th or 15th cookie cut out puppet game is completely predictable, boring and an insult to my intelligence. Honestly, I gave it the one star so I could submit a review, hoping that this developer and others can see there are gamers, like me, who are tired of the tedium and won't be buying this hogswallop! You get to find a piggybank and another collectable in the scenes. I've already forgotten what the collectable was, but I remember something about coins in the piggybank, so I'm assuming we get to play "dress the little puppets" again! Sigh! I found no challenge, or entertainment here! As always the graphics were quite pretty, but pretty isn't enough.